The VN-Index, which tracks 247 companies and four mutual funds, slumped 1.01 percent, or 5.12 points, to finish at 500.28. On the index, only 26 stocks advanced, 183 dropped, and 42 remained unmoved. Trading volume on the market remained above 50 million shares, approximately VND1.46 trillion. Pomina Steel Corporation (POM) declined 11.24 percent to VND37,900. The company will pay 2009 dividends in cash, with a ratio of 5 percent, on August 13, and by shares with a 15 percent ratio. It will issue 24.45 million additional shares, worth VND244.5 billion, increasing its chartered capital to more than VND1.87 trillion from VND1.63 trillion. Techno - Agricultural Supplying Joint Stock Company (TSC), located in the Mekong delta city of Can Tho, lost 5 percent to VND26,600. From July 22 to September 22, Pham Van Hung, brother of Pham Van Tuan – chairman of Techno - Agricultural Supplying Joint Stock Company (TSC), registered to buy 10,000 shares and sell 11,000 shares, sending his holdings to 5 shares, to balance his finances. Dat Xanh Real Estate Service & Constructions Corporation (DXG) slipped 4.99 percent to VND40,000. Vietnam Electricity Construction Joint Stock Corporation (VNE), which saw 2.36 million shares change hands, was the most active share in volume today. Ocean Group Joint Stock Company (OGC) followed with 2.12 million shares. Saigon Thuong Tin Commercial Bank or Sacombank (STB) came in third with 1.87 million shares. Among the few gainers, Ho Chi Minh City Metal Corporation (HMC) climbed for the second day, closing up 4.95 percent to VND23,300. Between June 14 and July 7, Pham Thi Lien, deputy general director of Ho Chi Minh City Metal Corporation (HMC) sold 107,500 shares, reducing her assets to 7,000 shares, accounting for 0.03 percent of the company’s chartered capital, for personal needs. Foreign Trade Development and Investment Corporation of Ho Chi Minh City (FDC) surged 4.86 percent to VND47,500. Ha Tien Transport Joint Stock Company (HTV) prolonged its winning streak for the sixth consecutive day, adding 4.76 percent to VND28,600. HNX-Index closed on a low note for the fourth straight day, eroding 1.29 points, or 0.81 percent, to 157.68. Liquidity fell sharply, to 37.93 million shares, worth VND1.1 trillion. The UPCoM-Index also lost 1.33 points this morning. 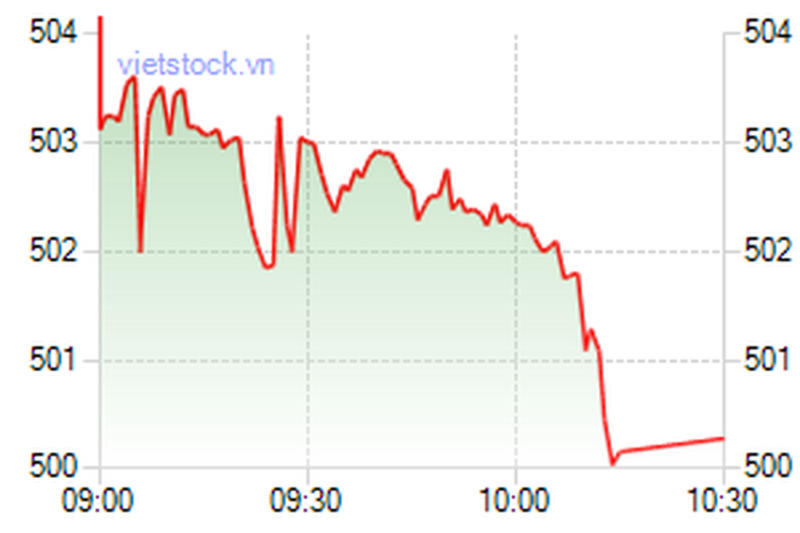 A total of 490,270 shares were traded, at VND9.62 billion, as of 11 am local time.